Chandigarh, Feb 12 (IANS) Punjab Chief Minister Amarinder Singh on Tuesday termed the protest by the Shiromani Akali Dal along with a handful of farmers near the Assembly a "petty political stunt" undertaken with an eye on the ensuing Lok Sabha polls. Hitting out at the Akalis and Lok Insaaf Party MLAs for walking out during the Governor's address in the House on the first day of the budget session, the Chief Minister said the Akalis had failed to do anything for the farmers for 10 years during their own rule (2007-2017) and were now "resorting to all kinds of cheap tactics in a desperate bid to mislead them on the issue of farm debt waiver". He said that his government had already helped 5.83 lakh farmers with its debt relief scheme and would soon cover all 10.25 lakh small and marginal farmers in the state. 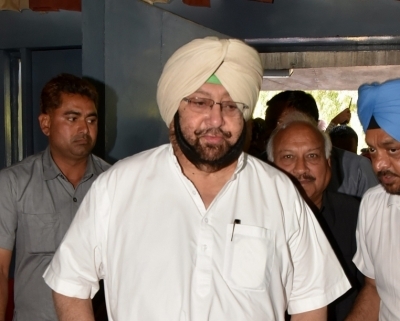 "The Akalis' attempts to undermine these efforts would backfire on them," Amarinder Singh said. "The Opposition walkout was a clear case of 'badtameezi' (rudeness) against the head of the state," he said while interacting with media informally after the Governor's speech. "The problem with the Opposition was that it had no issues to raise in the House and were thus trying to divert public attention by making noise on non-issues," he added.